One of our favorite projects to date was making the Act Up T-shirts and buttons. Back in 2012, we were privileged to have worked with ACT UP AIDS. Their Coalition to Unleash Power campaign included a call to action and the promotion of their documentary, “How To Survive the Plague,” so the campaign required lots of visibility. A fun and bold (and economical!) way to be visible is to go with wearable merchandise. So, this dedicated group of activists came to us for t-shirts and buttons, with a specific priority to buy sweatshop-free. Thank goodness for that, because that’s just what we at Ethix do! 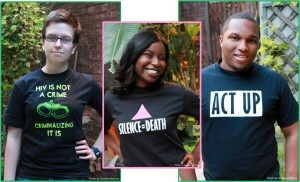 When the ACT UP t-shirts and buttons arrived, they coordinated with a professional photographer, Gustavo Moroy, to get the best shots of their union-made youth T-shirts at the LGBT Center in NYC. Even today, we see the buttons at marches and events, and their legacy continues to live on long after the campaign. In the image to the right you see iconic ACT UP t-shirts, the pink triangle “Silence = Death” t-shirt, and their latest addition, “HIV is not a Crime, Criminalizing it Is.” What we loved so much about this project (outside of the brilliant work that this organization does for our communities), is how impactful and eye-catching designs can be, like the iconic ACT UP t-shirts, even when printing a single color. In addition to the ACT UP t-shirts, we’ve been fortunate to have supplied apparel and merch for many other great campaigns including Climate Reality’s “I Am Pro Snow” tour and Coalition of Immokalee Workers’ Boycott Wendy’s campaigns. Do you have a special event or non-profit campaign in the works? We can help! From stand-out apparel like custom t-shirts, hats and jackets to fun merchandise like stickers, buttons and signage, you can count on Ethix to have just what you’re looking for. We can also help create a unique design for your campaign!